Controversial rally passes relatively peacefully. Counter-protesters arrested for donning costumes, signs: "I am a proud donkey." 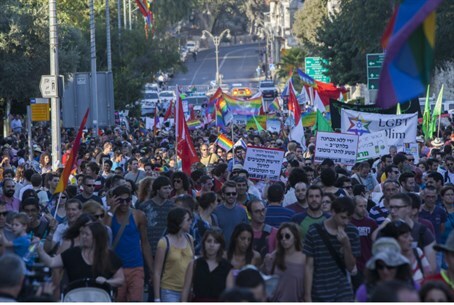 The annual Gay Pride parade and rally was held in Jerusalem on Thursday evening. Several roads were shut down during the parade, which traveled through the downtown area to a city park. As usual, the march drew counter-protests. The "pride" march is particularly controversial in Jerusalem, Judaism's holiest city, with many Jews and Muslims arguing that it encourages immoral acts and constitute a desecration of the holy city. One counter-protester was arrested for throwing a stink bomb at marchers. Their protest was similar to one that took place one year earlier. During the 2012 march, counter-protesters brought three donkeys wearing sheets with the words “I’m a proud donkey” written on them. Homosexual politicians in Israel have expropriated the Hebrew word "ge'eh," meaning "proud," to denote "homosexual," making use of the word's similarity to the English "gay." Thus "I'm a proud donkey" has a double meaning.